Disclosure: This is NOT a sponsored post. 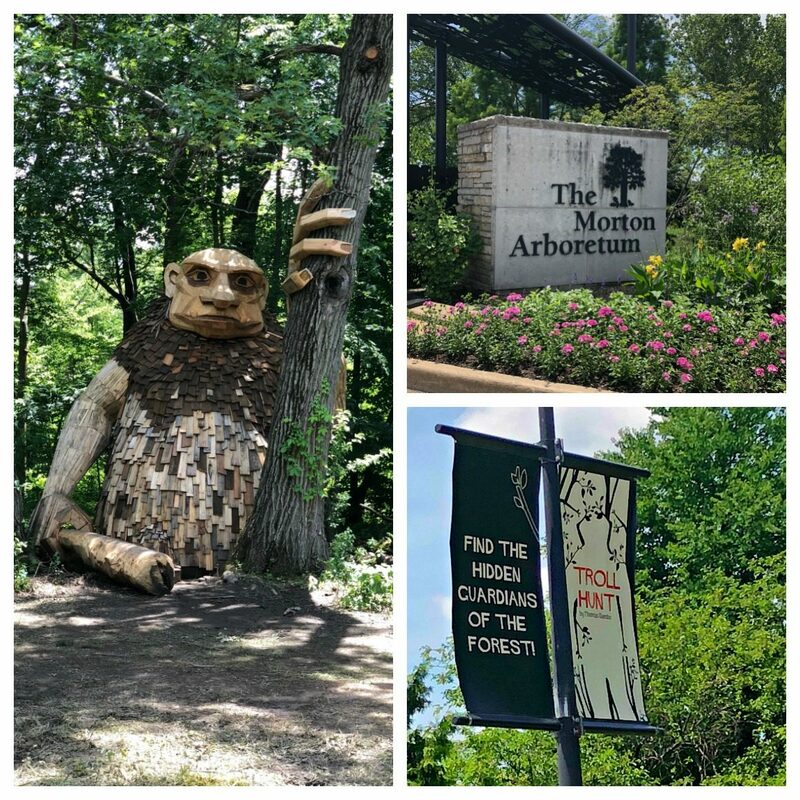 We loved visiting the Trolls at Morton Arboretum and wanted to share our tips with others headed out on a Troll Hunt! Would your kids love hunting for giant trolls? A few weeks ago, I saw on the news that Morton Arboretum in the Western Chicago suburbs was launching a new art installation. Six giant trolls, from 15 to 30 feet tall, have been hidden throughout the grounds of the arboretum. The trolls are the work of Danish artist Thomas Dambo, who uses reclaimed wood to handcraft each sculpture. 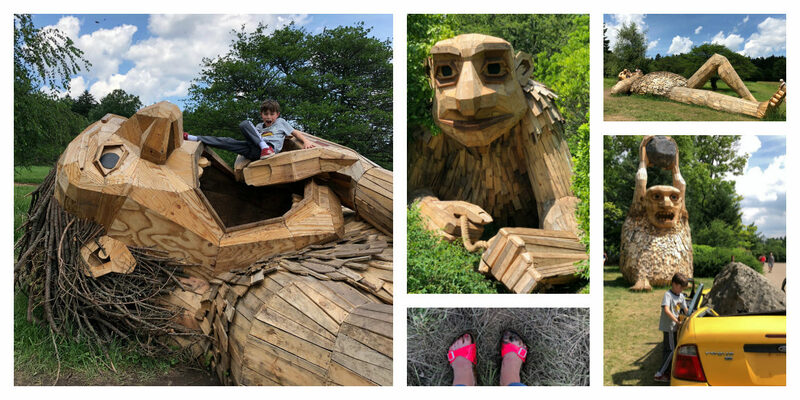 In a rare weekend off from travel, we decided to have a local Chicago family adventure and check out the giant Troll Hunt at Morton Arboretum on the opening weekend. Since we went fairly spur-of-the-moment, I was terribly unprepared for a troll hunt in the woods. I’ve since shared my tips with several local friends, and thought I would share them with my readers. 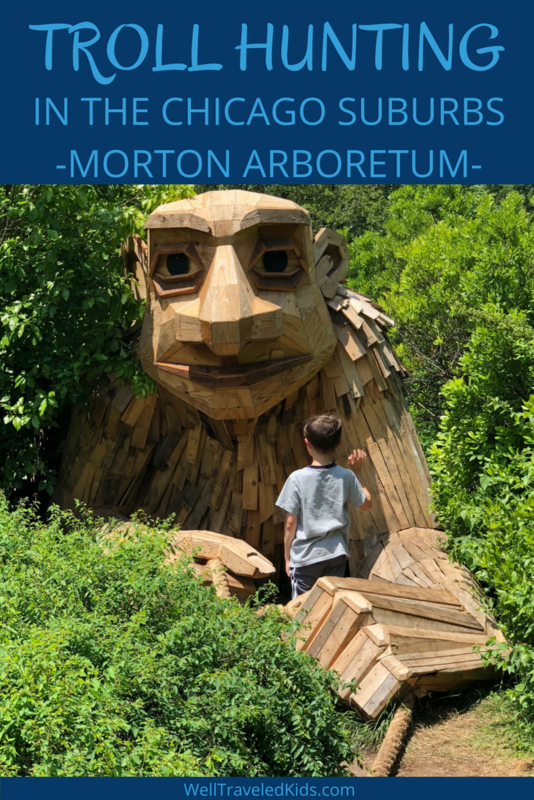 Morton Arboretum is 30 miles west of Chicago, so if you are going to drive all the way out there, you’ll want to be better prepared than I was so you can enjoy a full day of troll hunting with your kids. Here are my tips for going on a fun troll hunt with your kids! As members of the Chicago Botanic Garden, our family membership entitles us to two free tickets to the Morton Arboretum.This meant we only had to pay the $10 for our son’s admission while my husband and I received reciprocal passes through our membership. This saved us $30, so it’s definitely worth checking if your membership to other gardens allows a partial admission benefit to The Morton Arboretum! This sounds obvious, but was a big fail on our part. We live on Chicago’s north shore, only 45 minutes from Morton Arboretum. It was sunny and 72-degrees at home, so we thought it would be a great day to hike around and look for trolls. We didn’t consider that Morton Arboretum is in the Western suburbs and doesn’t benefit from lake-effect cooling. When we arrived, it was 90 degrees. When planning your visit to the Morton Arboretum trolls, be sure to check the weather for Naperville or Lisle as it can be very different from downtown Chicago. When we first arrived at Morton Arboretum, it was opening weekend for the Troll Hunt and there was a huge line of cars waiting to get in. We waited quite a while and my husband was ready to turn around and go somewhere else. We assumed the parking lot and roads through the arboretum would be equally crowded, but we were pleasantly surprised. Once you get through the entrance gate, everyone splits off in different directions and the crowds disperse. Even at the various troll stops, there was always plenty of parking. The arboretum is so spacious, it won’t be overwhelmed with people. However, if you want to avoid crowds altogether, going early in the day is a good idea. We aren’t big hikers, so I assumed we would drive the route and hop out to see each troll. I wore sandals since we didn’t plan on hiking. Each troll is located between two feet and three-quarters of a mile from the nearest parking lot. Even though it hadn’t rained for several days, it was still very muddy when we visited. I destroyed my sandals and had trouble getting around all the deep mud in some of the areas. I definitely recommend wearing good walking shoes that you don’t mind getting a little dirty. Bring bug spray, sunscreen, sunglasses and hats for the whole family. During our late June visit, there were lots of bugs and we got lots of bug bites. Bug spray would have been a great addition to our troll hunt. Even though you’re in the woods, there are many areas out in the open, so you will have direct sunlight. Make sure you’re prepared with sunscreen, hats and sunglasses! I knew the trolls would be cool, but didn’t anticipate taking so many photos. I only had my iPhone, and was really bummed that I didn’t bring my SLR to take better photos of the trolls. They are really cool up close, and you’ll want to capture the details of your troll hunt, so don’t forget the camera! A fun thing I like to do is give Harry a camera to take his own photos. It’s fun to see how our perspectives differ when visiting different attractions. When you enter, you’ll receive a Troll Hunt Map that shows you where to look for the Morton Arboretum trolls. Even if you think you’re going to drive the whole way, you’ll end up doing a bit of hiking at some of the trolls. The park has over 16 miles of trails, too, if you are looking for a bigger hike before or after the Troll Hunt. Some families brought their bikes and that looked like a super fun way to spend the day together. You can also rent bicycles outside the Visitor Center. When you arrive at the Arboretum, ask for a Troll Hunter’s Handbook to start your search. The Handbook will help you find a clue for each troll to locate the Troll’s secret hideout, complete with a troll-size toothbrush and other troll essentials. We spent two to three hours on the Troll Hunt and didn’t see everything before the heat got to us. In that time, we only saw five of the six trolls and we didn’t find the secret hideout. If you want to see them all, you should plan spend at least 3 hours because once you find each troll, you’ll want to spend some time there and take pictures. 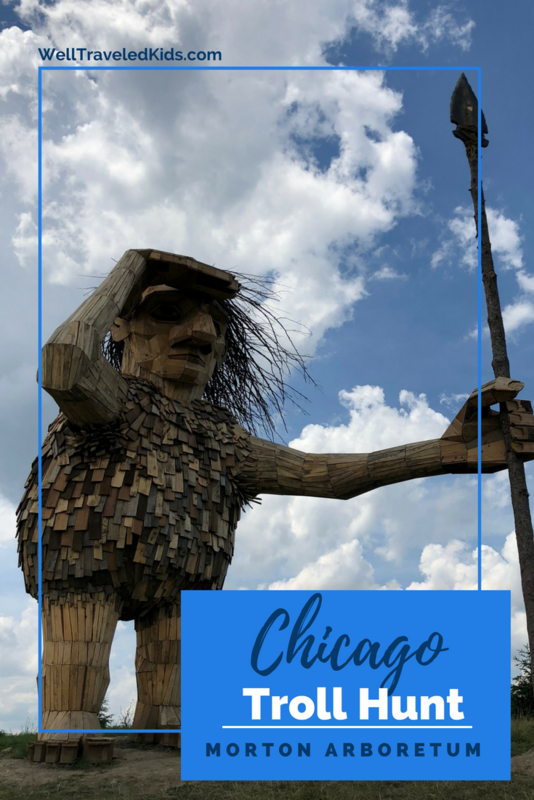 The trolls will be at Morton Arboretum through Spring 2019, so you have plenty of time to plan a family Troll Hunt in the Chicago suburbs! Planning on going Troll Hunting? Pin these tips for later! Next Post Top 10 Reasons to Visit Camelback Resort Poconos with kids of all ages!